Regular readers of this blog know that I have been ranting about how someone pretending to be Swedish football forward Zlatan Ibrahimovic on Twitter has managed to fool Italian and international media at several occasions. Well, no more. The account @therealZlatan11 has now been suspended, or the prankster himself/herself decided to close the account. With a simple tweet, he could reach millions of readers before traditional media had time to react. But not everything on Twitter is what it seems to be. Carrey has a verified account on Twitter, which certifies that it is actually The Jim Carrey that is tweeting (or someone he has hired to do so). So if a celebrity doesn’t have a verified Twitter account, you should probably think twice before you assume it is the real thing. I have blogged before about how AP, Al Jazeera and a bunch of other media quoted a fake Zlatan Ibrahimovic account on Twitter. It didn’t take much work to prove it was fake. And yesterday it happened again as media started to cover the Champions League game tonight between AC Milan and Zlatan’s old club Ajax. Italian tv channel Sky Italia quoted @therealZlatan11 in an article that suggests that “Ibra” had tweeted “I cheer for the success of Ajax, but not tomorrow”. Of course this is not the real Ibrahimovic. He has never been active online and certainly not on Twitter. You would only need to click on the link in the Twitter bio to see that the link is not to an official site, but to a rather poor fansite from the Netherlands. If traditional media are going to use celebrities in social media as sources for news, they need to put a little more effort in to research to verify that the source is correct. Otherwise they will look pretty foolish. Footnote: Thanks to http://twitter.com/ItalianMeetup for the scoop about Sky Italia. 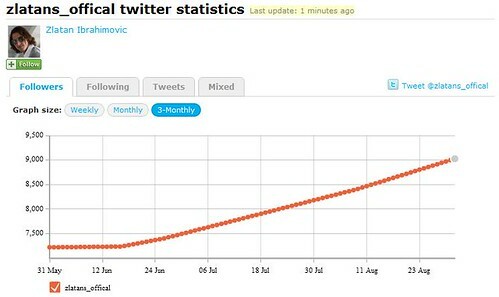 As the Swedish football striker Zlatan Ibrahimovic this weekend declared that he is leaving FC Barcelona for AC Milan, my blog posts about the fake “Ibra” on Twitter” has gotten tons of traffic. I guess it’s a natural reaction nowadays – a player is discussed frequently in the media and fans want to know if he is on Twitter so that they can follow his updates directly. Stats from Twittercounter.com. I’m @kullin on Twitter by the way. I might not be spectacular, but I’m real. What do Associated Press, Al Jazeera, SVT (Swedish television), Sydsvenskan and Shanghai Daily have in common? 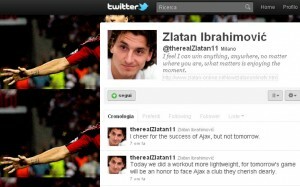 They were all fooled by a prankster pretending to be Zlatan Ibrahimovic, the Swedish football striker, on Twitter. AP seems to be the origin of the story which spread across mainstream media last night. Sydsvenskan writes that “according to AP, Zlatan is quite talkative on his twitter-blog” and quotes one tweet saying “I have won everything in Italy, its time to move on! I want the champions league title!”. Shanghai Daily writes: Ibrahimovic appeared prepared to accept the move after writing “time to learn Spanish” on his Twitter page. But if you have any knowledge about Ibrahimovic, you would do at least a little research before assuming that he is on Twitter. Microblogging would be a very un-Zlatan like thing to do since he keeps his private life to himself and for years have not have had a decent official webpage. The first thing you would do is check if the Twitter account is a Verified Account. Sure, verified accounts have just recently been introduced for Twitter but it is a good way to secure that celebrities are the ones actually tweeting. The second thing to do would be to search for Zlatan and Twitter on Google. That would immediately have revealed my blog post from June 22nd, which shows that in fact the Zlatan account is fake. For example, the “mobile photos” that he has posted are taken from a photo agency and from a TV documentary on YouTube. Hat tip: Robert Laul and David Hylander.